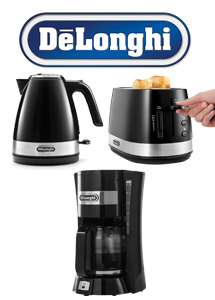 The New Active Line is here again from DeLonghi in the form of the active line. This new range consists of a 1.7L Kettle (KBLA2001) with 3kw power, 2 slot Toaster (CTLA2103) with high lift, and variable browning and cool touch housing. To round off the range DeLonghi bring you a new drip Coffee Maker (ICM14011) featuring a 5-cup capacity, jug warmer, glass carafe and V shape filter.